Sanibel Captiva Beach Resorts has launched a combined live beach camera website located at SanibelCaptivaBeachCams.com. It serves as a location to view all four of the Sanibel Captiva Beach Resort on-property cameras, located at ‘Tween Waters Island Resort & Spa, Beachview Cottages, Castaways Cottages and West Wind Inn. The beach cam site hosts four live video views of the beaches of Sanibel and Captiva Islands. Each of the live videos are located on their respective property websites as well as this new collective website. 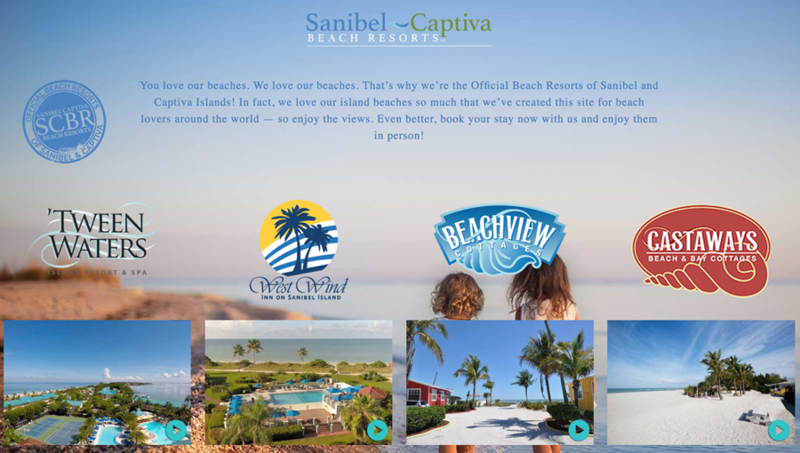 Check-ins at each property can be performed with simple clicks to the property buttons located SanibelCaptivaBeachCams.com. The videos are high definition, streaming video, without delay in feed. Visitors to the site enjoy checking in on the popular Sanibel and Captiva sunsets, current weather conditions and views of their anticipated vacation accommodations. The site also features direct buttons to the four properties’ websites, specials, dining, reservations and more. Individually, the beach cams are some of the most popular pages on the property websites since the properties began live feed of the beaches in 2009. The live beach cam feeds were provided to news sources and local tourism outlets during Hurricane Irma of September, 2017 and current live feeds to the Sanibel & Captiva Chamber of Commerce and VISIT FLORIDA.